The Motorola Atrix 4G comes with the full suite connectivity. It offers quad-band GSM/GPRS/EDGE and quad-band HSDPA, whereas the global version of the Atrix offers only tri-band HSDPA, both capable of speeds up to 14.4 Mbps HSDPA and 5.76 HSUPA. The local connectivity features include Wi-Fi a/b/g/n (with DLNA support), Bluetooth 2.1 with A2DP and a microUSB port. Also the mobile hotspot functionality is present with the Atrix 4G. There’s a microSD card of course, and if you need to do bulk data transfers then using this will be faster than over USB. The Phone portal app however was the most impressive part of the connectivity package. It practically lets you browse the phone’s contents on your desktop browser. You can connect over USB or via Wi-Fi – once you start it, the Atrix will give you an IP address to type in the computer’s browser and you’re good to go. You can even password-protect the connection. From then on, you can browse photos and files (the file browser works only with Internet Explorer though), adjust settings and also manage contacts – including composing and sending messages. The idea is great – you don’t always need the full functionality of a PC Suite (the Phone portal can do quite a bit) and you can’t always have the PC Suite installed on the computer you’re using. Samsung has a similar solution on the Galaxy S II, it’s called the Kies Air. We already previewed it and we’re rather happy how it works there too. Moto clearly understands that it’s a fast paced tech world we live in. That’s why owning laptops, desktops and tablets all at the same time seems just too much for the regular Joe. Motorola came up with the ingenious idea to wash away the line between all these products and make one that could easily act like all of them combined. 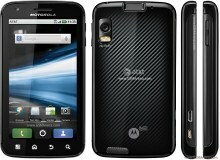 The Motorola ATRIX 4G manages to shoot two rabbits with just one bullet. At first sight it’s this pocket-friendly dual-core smartphone, but put it into one of the special docks and it becomes a totally different animal. The Laptop Dock transforms the ATRIX 4G into a fully-fledged netbook. The Laptop Dock looks just like a laptop, but behind the 11.6-inch LCD backlit monitor, there’s a special place for the ATRIX 4G to dock onto. The dock itself is a true example of the “what you see is what you get” paradigm. It only comes with a keyboard, a touchpad, a screen and a 36Wh battery, that will keep the thing going for 8 hours. There’s no other hardware to power it around except the ATRIX 4G’s dual-core prowess. The other intriguing dock – the HD Multimedia dock – is used mainly to connect the ATRIX 4G to a larger screen HD monitor or television set. The HD Dock comes bundled with a Bluetooth keyboard, a mouse and a remote control. Both docks feature two USB ports, so anything from flash drives to keyboards and mice can be attached with no hassle. And finally, the Regular Dock is just like the Multimedia one but without the cool accessories. Docking the ATRIX 4G to any of the three docks automatically launches the Webtop application on the connected external screen. Behind that fancy name, it’s a Linux distribution, which packs some useful features. For example, you can send messages, call contacts, watch videos and even browse the web using a full version of the Firefox web browser. The web browser on Android Froyo devices has always been a good one, we already know that. On the Motorola Atrix 4G is even packs Flash support for a closer-to-desktop experience. The browser UI is minimalist, it’s how Google intended it, All you have on the screen, apart from the webpage is the address bar and bookmark icon. When you scroll down they disappear. If you hit the menu key six new virtual buttons pop up. You can open a new tab, bookmarks, switch tabs, refresh the page, and go forward. The last button reveals even more options (text copying, find on page, etc.). The Atrix 4G supports two zoom methods in the browser: double tap and the multi-touch pinch zooming. Both seem fluid and fast. Unfortunately, when you zoom in the text doesn’t reflow to fit the screen and you have to scroll sideways to read the text. The Atrix 4G browser supports Flash and thanks to all that computing power inside you can even watch embedded 720p videos straight from within the web browser. Playing Flash games is great too. The MOTOBLUR UI used over the Android 2.2 interface is great at combining social integration with the phone’s features. We’ve already showed you the social implementation in the messaging app, the phonebook and gallery. There’re also live widgets with social updates in mind, which you can directly place on your homescreen, to keep you up to date. The first one is Social Networking. It can display status updates from all your social networks (or just the ones you pick) and it can be used to set your status on some or all social networks. The Messaging app has support for both Facebook and Twitter. Its main job is sending messages between contacts more than posting general status updates. The interface looks deceptively similar to the SMS messaging UI. It displays conversations in threaded view, with speech bubbles when viewing a single thread. Then there’s the Social Status widget, which lets you post statuses directly from your homescreen to social networks you’ve selected. It’s a more dedicated status-setting app/widget that the Social Networking one. The Status’ live folder is here – it’s small and space efficient, but when you tap it, it expands to fill the screen with the latest status updates from your preferred social networks. Overall the social networks integration of the MOTOBLUR UI is strong and very useful if you’re into all that stuff. It can save you a lot of time and trouble if you’re constantly checking and updating your profile and preferred network.